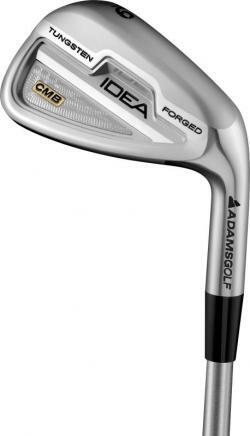 Adams Golf latest offering, the IdeaCMBirons, are targeted at better players both professional and amateur. They feature a classic looking head made of multiple materials that the company says provides a high degree of forgiveness. When you first pick up aCMByou notice the nice looking nickel-chrome satin finish on the forged blade. 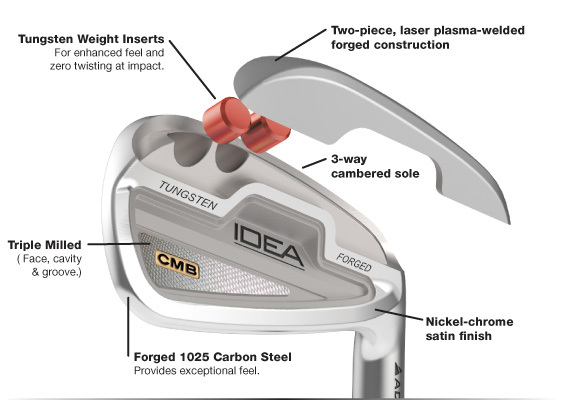 What you will not see are tungsten plugs located in the toe to provide the proper weight distribution and the “precisely centered placement” of the head’s center of gravity. IdeaCMBIrons stock shafts are the KBS C-Taper (steel street $999) and the Matrix Ozik Program 8.1 (graphite street $1,099) while the grip is the Golf Pride New Decade MultiCompound White Out.